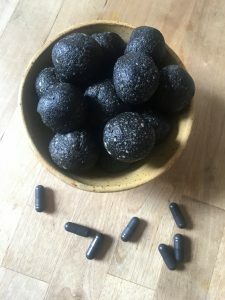 Activated Charcoal Energy Balls | Ridge's Stitches | Health Coach. Yoga. Clothing. I was on a little bit of an activated charcoal kick the other week. The uses for this stuff is out of this world. Check out the blog here to discover more articles on activated charcoal. You know I have a pretty big obsession with energy balls so here is a new one for ya! Pop one of these black balls into your mouth and let me know what you think! They’re made with lucuma powder. Lucuma powder is a low GI natural sweetener made from a Peruvian fruit. It contains calcium, zinc, iron, vitamin C, B3 and fiber. It also has antibiotic, antimicrobial, and anti-fungal properties. You can pretty much put any nuts or seeds in this recipe. The cashew and almond mixture was the perfect touch. Although activated charcoal is detoxifying, it’s a bit hard to get out of your clothes! You may want to wear something you don’t care much about if you give this one a whirl. Soak the dates in warm water for about 10 minutes to get them soft and sticky. Place the nuts, cashews, shredded coconut and lucuma powder in the food processor until finely ground. Put aside in a bowl for a moment. Place the pitted dates into the food processor and pulse a few times. Turn on high and process until a thick paste forms. Stop motor, remove top and scrape down sides. Add coconut oil, honey, vanilla extract, and sea salt. Process until well mixed. 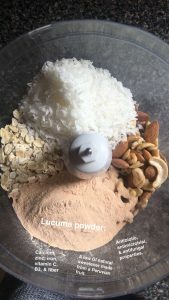 Add the almond, oat, coconut, and lucuma mixture to the food processor. Open the capsules and dump the activated charcoal in. Pulse a few times then process until the mixture turns into a ball. Nuts will still be visible but it should be pretty mixed together. Add more honey if the mixture is too crumbly and dry. It should feel like playdough. Refrigerate for 30 minutes. Roll into bite size balls! Store in the refrigerator in an airtight container. They will keep for about a week in the fridge or several months in the freezer.